Last year, I posted a list of festivals I had found that were scheduled along or near the National Road during the summer months. It proved to be one of the more popular posts this blog had, so I figured I would update the list to reflect this year’s events. If there’s anything that should be added, I’d like to know! May 29-June 2: 10th Annual National Road Yard Sale, Maryland to Missouri. See information from Old Storefront Antiques, where the tradition started, here. June 8-19: 45th Annual Heritage Days Festival, Cumberland. June 28-30: 36th Annual Grantsville Days, Grantsville. July 4: 37th Annual Soapbox Derby, Frostburg. Sept. 21: Bicentennial Celebration of the Casselman River Bridge (see the bridge on this blog), Grantsville. May 17-19: 40th Annual National Road Festival, Southwest Pennsylvania. June 13-15: The 10th Annual National Road Chainsaw Carving Festival, Addison. June 15: 12th Annual Beer & Gear Festival, Ohiopyle. Aug. 5-10: Mountain Area Fair, Farmington. Aug. 9-11: The 33rd National Pike Steam, Gas & Horse Assn. Show, Brownsville. Aug. 23-25: Italian Festival of Fayette County, Dunbar (near Uniontown). Sept. 2-7: West Alexander Fair, West Alexander. Sept. 21-22: 43rd Covered Bridge Festival, Washington and Greene counties. June 28-30: Ohio Valley Black Heritage Festival, Wheeling. July 26-28: Upper Ohio Valley Italian Heritage Festival, Wheeling. Aug. 9-11: Heritage Music Bluesfest, Wheeling. Aug. 24: 6th Annual Wine and Jazz Festival, Wheeling. Aug. 30-Sept. 1: Wheeling Vintage Raceboat Regatta, Wheeling. June 13-July 20: Springfield Summer Arts Festival, Springfield. July 12-13: Zanesville Pottery Lovers’ Show and Sale, Zanesville. July 18-21: Jamboree in the Hills, Belmont. Aug. 2-3: Y Bridge Arts Festival, Zanesville. Aug. 9-11: 45th Salt Fork Arts & Crafts Festival, Cambridge. Aug. 16-17: Reynoldsburg Tomato Festival, Reynoldsburg. Sept. 21-22: Preble County Pork Festival, Eaton. Sept. 28: Hebron Music and Arts Festival, Hebron. May 23-June 1: Banks of the Wabash Festival, Terre Haute. June 5-8: Jubilee Days, Knightstown. Sept. 7-8: Hoosier Fall Fest, Knightstown. Sept. 20-21: Quaker Day Festival, Plainfield. Oct. 3-6: Riley Festival, Greenfield. October: 10th Annual Clay County Popcorn Festival, Brazil. May 31-June 2: Fun Fest for Air-Cooled VWs, Effingham. Labor Day Weekend (unconfirmed dates): Casey Popcorn Festival, Casey. September (unconfirmed dates): Grand Levee/Harvest Festival, Vandalia. Fall (unconfirmed dates): Harvest Moon Music Festival, Vandalia. 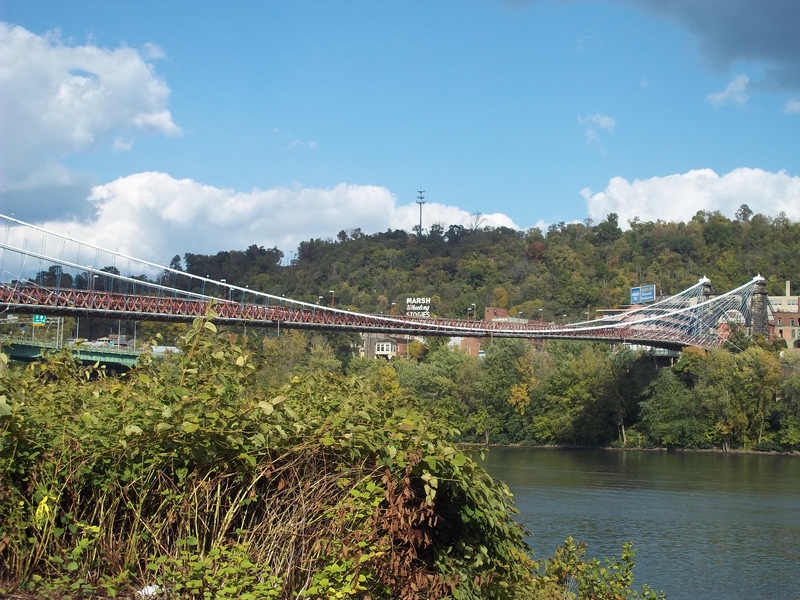 Mile 132 – Wheeling Suspension Bridge, Wheeling, W.Va. The Wheeling Suspension Bridge as seen from Wheeling Island. Many of the icons that make driving an old road enjoyable are actually part of the road itself. 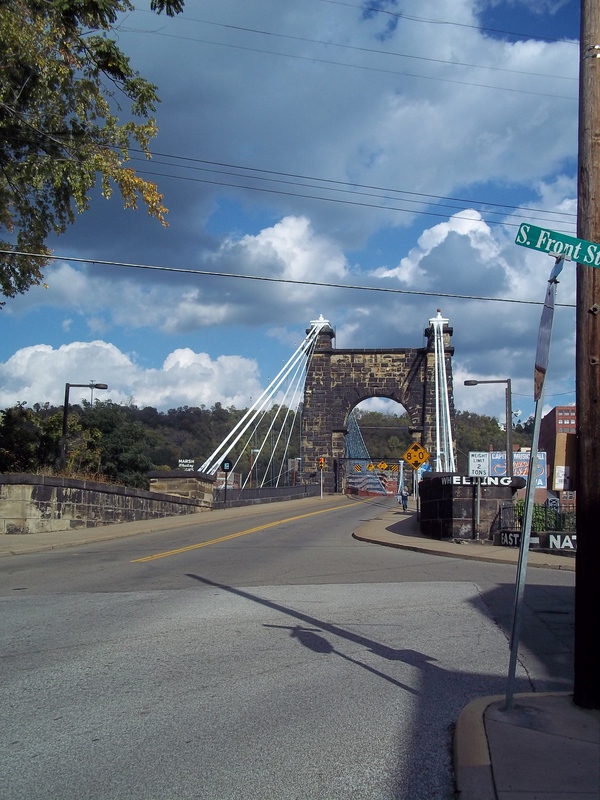 In Wheeling, the Wheeling Suspension Bridge is an attraction in and of itself. The bridge was built in 1849 specifically to carry the National Road across part of the Ohio River, connecting downtown Wheeling with Wheeling Island. 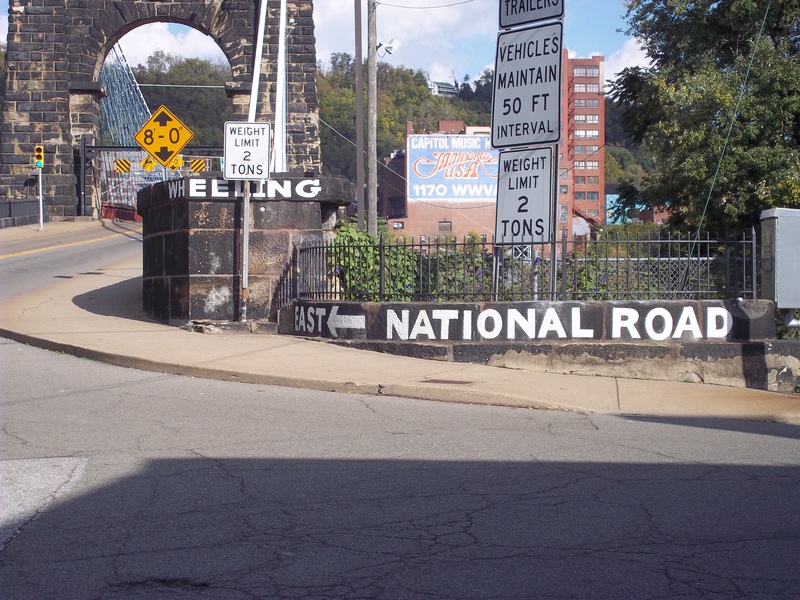 Another bridge would then take the National Road from Wheeling Island (in then-Virginia) to Ohio. And while the bridge has been replaced as the main thoroughfare across the Ohio, it remains the oldest suspension bridge still in use in the United States. The bridge has been fitted with numerous modern traffic control measures. A drive across the bridge is an experience in itself. The open steel grates create a odd effect that seemingly reduces the grip the car has to the roadway, and is one reason why low speed limits are in place. Because the bridge was built before the invention of heavy automobiles, stoplights at either end of the bridge ensure no more than a handful of cars can be on the bridge at any one time. Heavy vehicles are banned from the bridge entirely. All vehicles are required to maintain 50-foot intervals from one another. Markings on either side of the bridge define the structure as being part of the National Road. At roughly 1,000 feet long, the bridge was the longest suspension bridge in the world from its construction until 1851. However, the bridge deck collapsed in 1854 during a severe storm, and subsequently had to be rebuilt. The bridge was added to the National Register of Historic Places in 1970 and was named a National Historic Landmark in 1975. Due to U.S. 40 being re-routed over I-70 from downtown Wheeling to Ohio, the Wheeling Suspension Bridge is no longer directly on U.S. 40. Instead, eastbound travelers should use W.Va.-2 south (Main Street) to 10th Street, which is the bridge. On the Wheeling Island side, the bridge is part of Virginia Street. 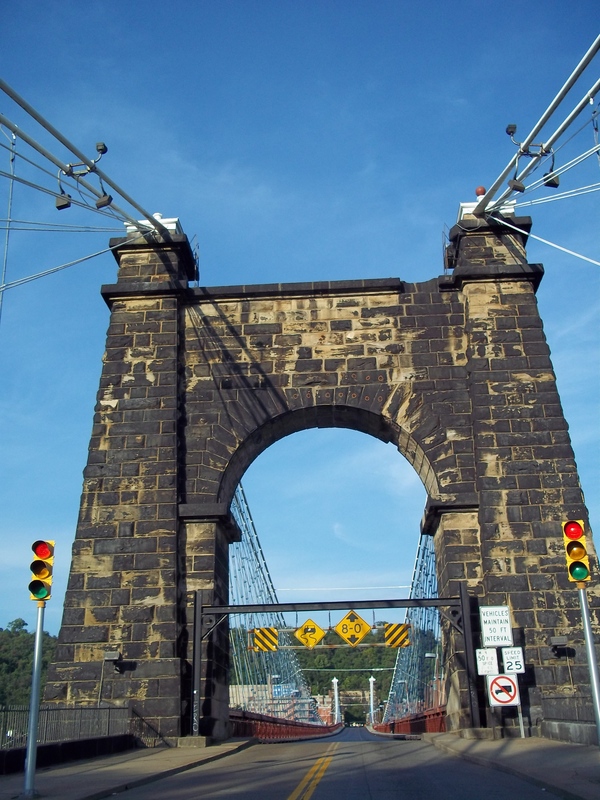 When it was built, the Wheeling Suspension Bridge was the longest in the world. 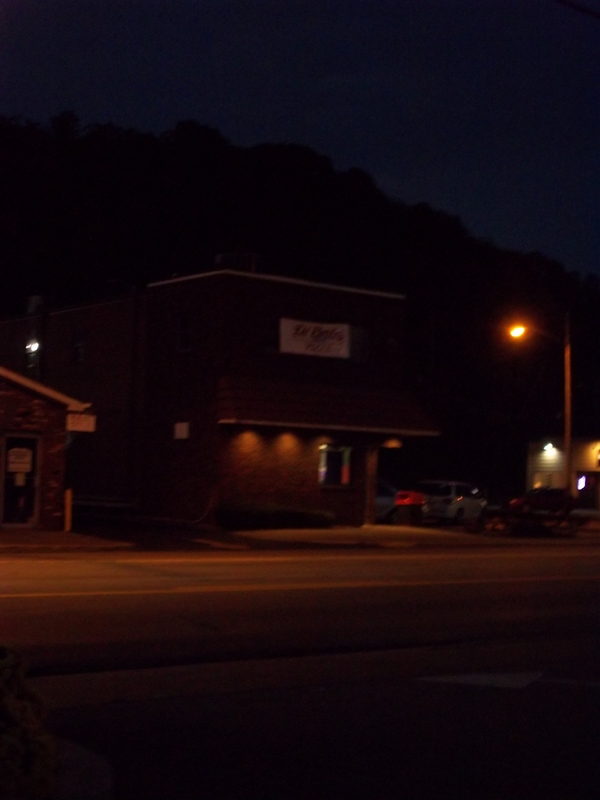 Mile 126 – DiCarlo’s, Elm Grove, W.Va. Residents of West Virginia’s Northern Panhandle rant and rave about DiCarlo’s – a pizza tradition born and raised in this part of the Ohio River Valley. According to the DiCarlo’s website, the pizza recipe for which it is so famous was created in the late 1940s by Galdo DiCarlo, the third son of Michael and Caroline DiCarlo, who operated a grocery store and bakery. What makes DiCarlo’s pizza unique is the way it is made. Unlike traditional pizza, DiCarlo’s bakes the crust and sauce, then adds the majority of the diced provolone cheese to the pizza as the pizza cools. So, a fresh DiCarlo’s pizza will likely have unmelted cheese or cheese that is in the process of melting. Pepperoni is standard on pizza. 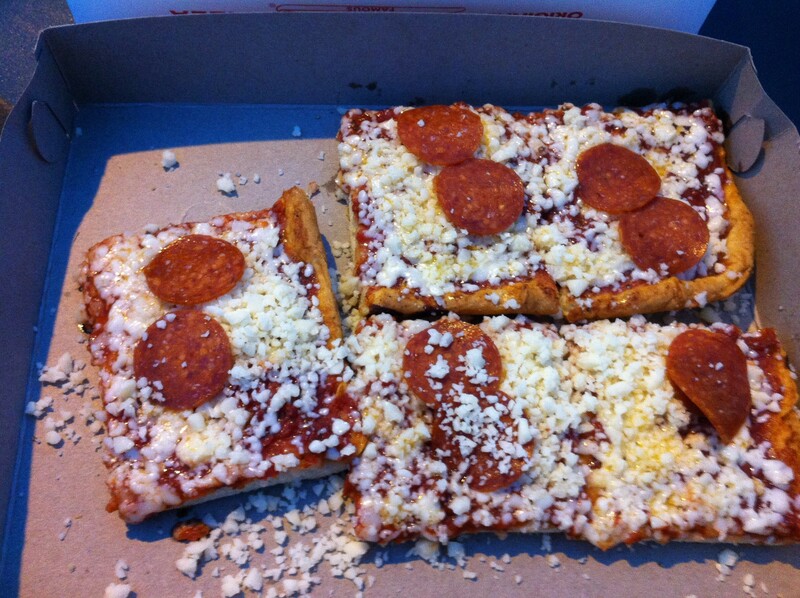 Notice the freshly-spread cheese across the pizza. Today, the DiCarlo’s franchise has grown to 12 locations in and around Wheeling, stretching from New Martinsville, W.Va., in the south to Wellsburg, W.Va., in the north. There are also DiCarlo’s outposts elsewhere in West Virginia, Pennsylvania, Ohio and the Hampton Roads area of Virginia. The Elm Grove DiCarlo’s sits right along U.S. 40. But don’t think that all of these locations serve exactly the same product in exactly the same atmosphere — no. All DiCarlo’s eateries have pizza, but some have dine-in areas and some have expanded menus. What I’ve found is that local residents tend to think that “their” hometown DiCarlo’s is better than another DiCarlo’s down the road (and maybe that thinking keeps each DiCarlo’s in business!). Regardless, from what I could gather, the DiCarlo’s in Elm Grove is the original DiCarlo’s franchise (though, if that’s not true, I’d like to know!). This DiCarlo’s is smack on the National Road, tucked between that historic highway and I-70, which seems to have sliced right through the middle of Wheeling and its surrounding communities. 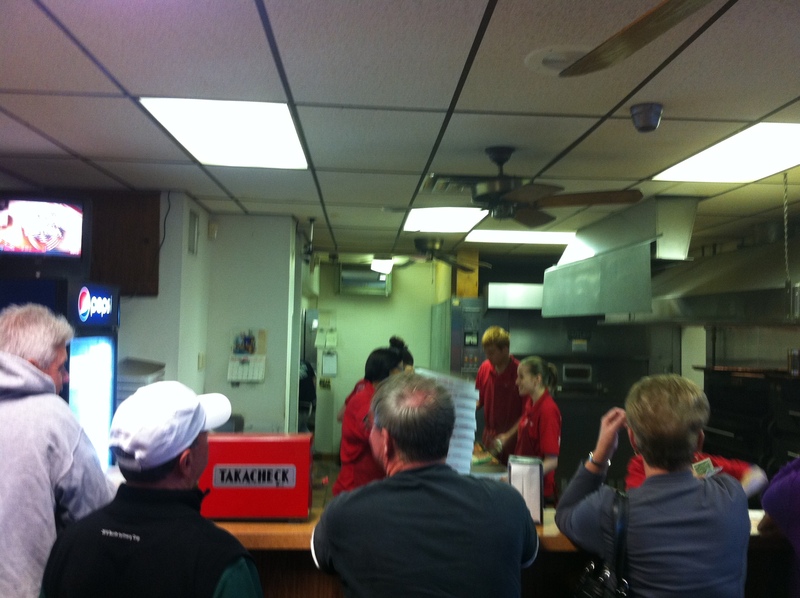 The kitchen at the Elm Grove DiCarlo’s. In this DiCarlo’s, there is no dine-in area. Instead, you can either call ahead or place your order at the store and wait. 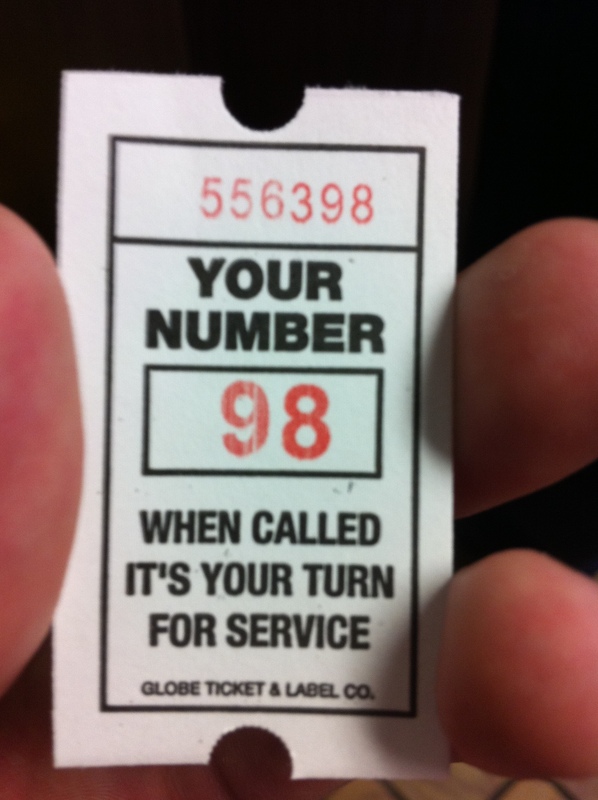 Each order is assigned a number, and orders are supposed to be finished in regards to their respective numbers. Pizza is sold by the slice, which is square, and extra cheese is available for extra cost (it comes in small bags and is put on separately by the customer). At the Elm Grove spot, slices are offered in amounts from 1-28. If you’re on the go, soda is available at vending machines in the waiting area. When your number is called, you pay, take your food and go. 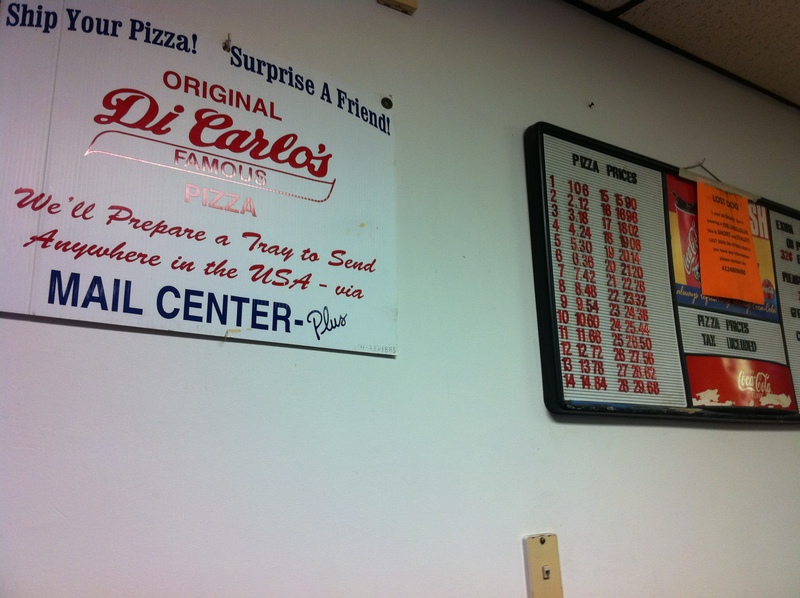 Apparently this DiCarlo’s mails pizza? I met a friend for dinner, and we ended up eating outside, putting our pizza on the back of her car and eating out of the box. For all the hype surrounding DiCarlo’s, the pizza absolutely lived up to its expectations! It really is quite a change from traditional pizza, as the cold, melting cheese adds a different flavor. Like other established local restaurants, pizza at DiCarlo’s is a great deal for the wallet. At a little over a dollar per slice, the quality and freshness of the pizza beats out the national fast food chains. 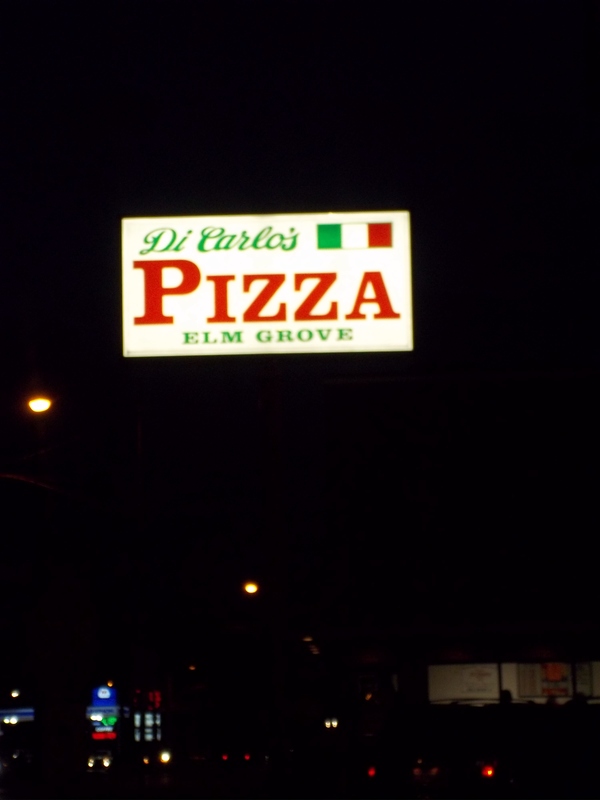 The Elm Grove DiCarlo’s is located at 2099 National Road in Elm Grove, just east of Wheeling. It is closest to Exit 5 on I-70. It’s open from 3 p.m. through the late evening, so this DiCarlo’s is not the best spot for a lunch stop. To order ahead, call 304-242-1490. 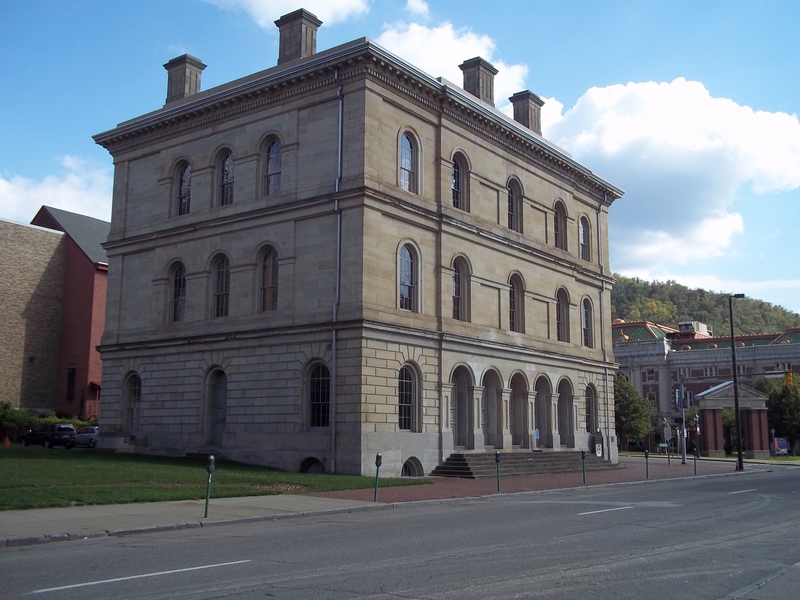 Mile 132 – West Virginia Independence Hall, Wheeling, W.Va. The exterior of the WVIH in Wheeling, taken from Market Street. In Wheeling, the state of West Virginia was born. Though the state capital moved to Charleston permanently in 1885, the spirit of those Virginians against secession from the U.S. during the Civil War is preserved in this city on the Ohio River. Arguably the centerpiece of historic sites from West Virginia’s early history is the West Virginia Independence Hall, now a modern museum. Originally a U.S. Customs house built in 1859, the building became the center of the Reorganized Government of Virginia (later West Virginia), and was where the Wheeling Conventions took place, which produced the new state. Independence Hall in its modern condition, to me, is very underrated and under-promoted. The quality of the exhibits in the museum is impressive, and the museum staff is extremely knowledgeable about the building’s history. The window of the restored U.S. Customs office overlooks another historic building in Wheeling – the former B&O train station. Like many older buildings, Independence Hall has seen several uses throughout its existence, from the U.S. Customs facility to a federal courthouse to the center of the creation of West Virginia’s early government to a number of private uses. While the building today has been restored to its original appearance, at one time, the building was expanded to include more floor space – both horizontally and vertically. In the 1960s, the state of West Virginia bought the building from private use, with the intention of restoring Independence Hall through the West Virginia Independence Hall Foundation. After restoration was complete, the building was opened as a museum in the late 1970s. The museum is operated by the West Virginia Division of Culture and History, which also runs the West Virginia Culture Center in Charleston. This museum is ideal for anyone the least bit interested in history, especially those interested in historic renovation or the Civil War. The museum occupies three floors, and is designed to have visitors begin on the third floor and work down through each floor. The third floor houses the restored 19th Century courtroom, plus the restored judge’s chamber. Visitors are free to walk about the courtroom, and informational signs provide a concise history of the room and its uses over the years. One of the Civil War-era flags preserved at WVIH. Flash photography is prohibited in this exhibit. 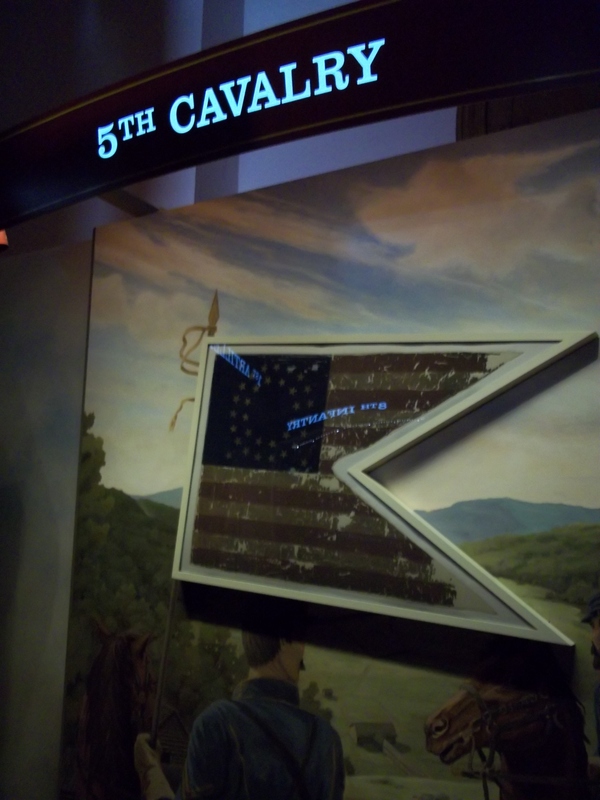 The second floor contains the gem of the museum – a rather large exhibit containing battle flags carried by companies that mustered across West Virginia during the Civil War. Because of the fragile nature of these flags, each is preserved in a controlled environment, and no flash photography is allowed in the exhibit. Tying in with the actual flags is another exhibit that features information on flag restoration and the relevant procedures. Also on the second floor is an exhibit detailing the process of restoring Independence Hall to its original shape and size in the 1960s. The exhibit points out the extensive attention to detail that was paid during the restoration efforts. In addition, a replicated U.S. Customs Office and the original West Virginia Governor’s office are on the second floor. 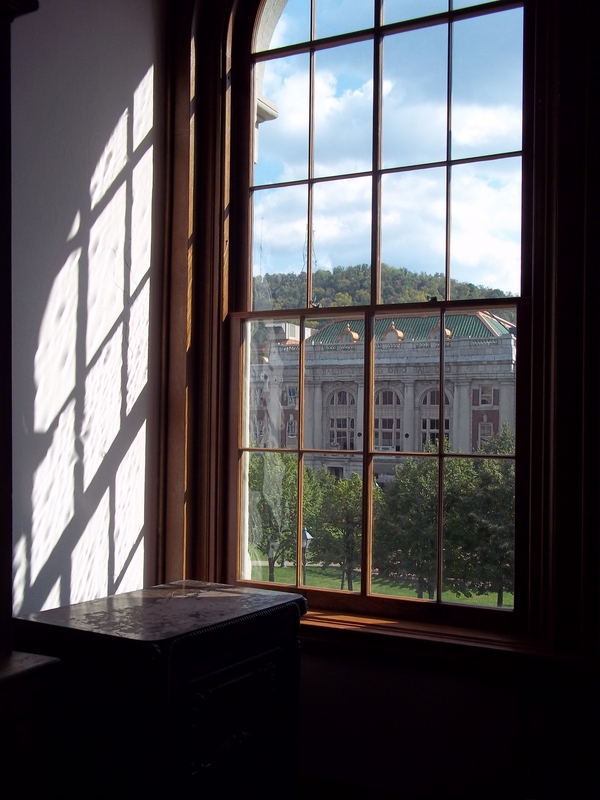 The first floor has more general exhibits on the Civil War and Wheeling history. The West Virginia Independence Hall is on the corner of Market Street (W.Va. 2 North) and 16th Street in downtown Wheeling. The museum is open Monday through Saturday from 10 a.m. to 4 p.m., and is closed Sundays and government holidays. Admission is free (Note: some Internet websites list an admission price, but that is no longer true). A small parking lot for the museum is off 16th Street. 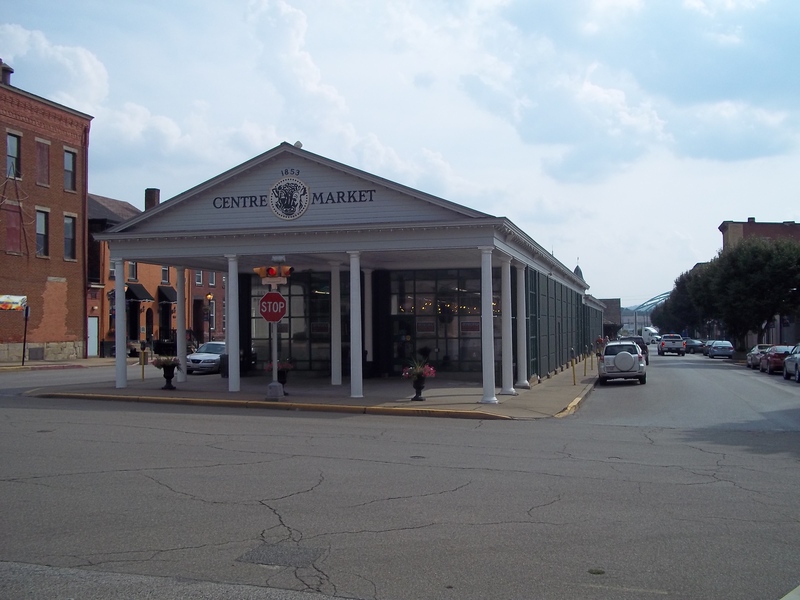 Mile 132 – Centre Market, Wheeling, W.Va. The front of Centre Market along 22nd Street in Wheeling. Centre Market seems to be one of the bright spots in Wheeling’s efforts to revitalize its older neighborhoods. The market itself and the surrounding neighborhood are listed on the National Register of Historic Places as the “Centre Market Square Historic District,” though the market itself also has its own NRHP designation. 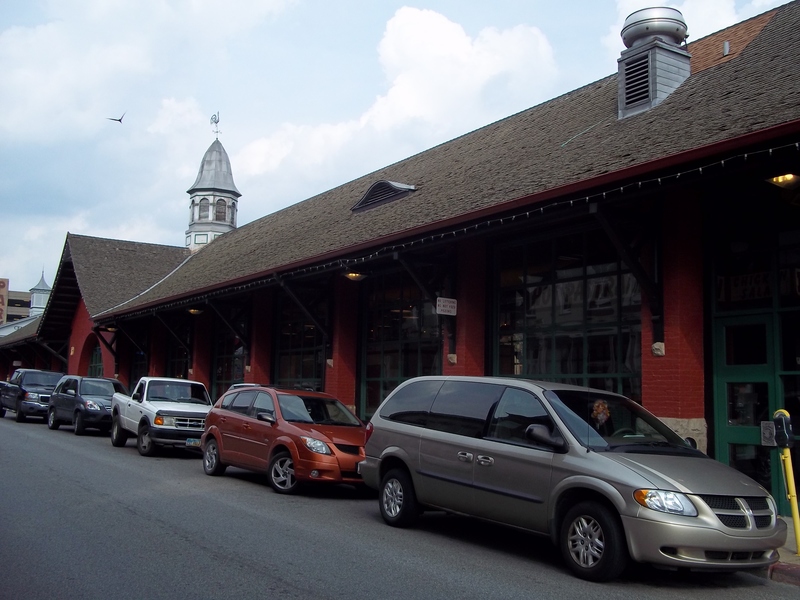 The market is made up of two distinct sections – one older and one “newer.” The earliest section, built in 1853, is believed to be the oldest still-standing iron market house in the country. This neo-classical section is now enclosed and painted white and green and has its original belfry. The second section, further south and made of brick in a neo-Romanesque style, was built in 1890 for primary use as a fish market. 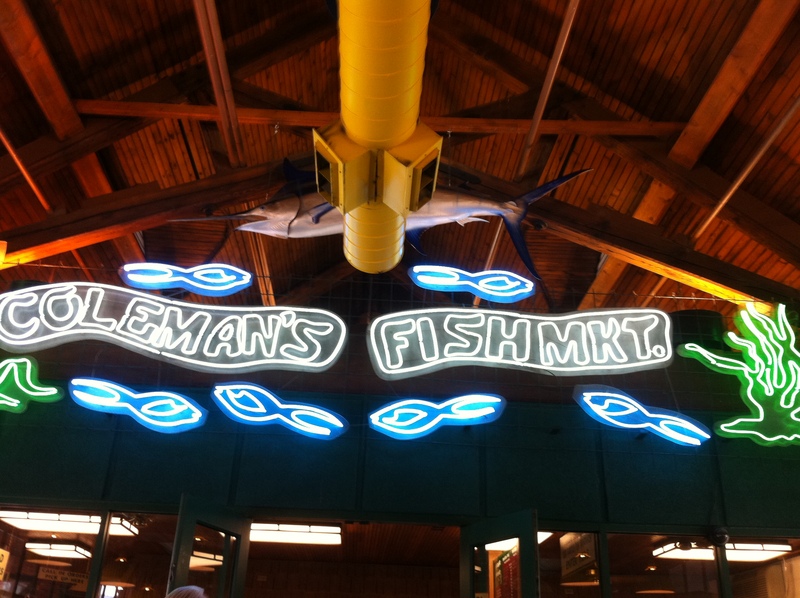 The building’s original use lives on through Coleman’s Fish Market. A more detailed description of the building’s past is available here, on the NRHP application from the 1970s (This link from the Ohio County Public Library has much of the same information on the application, but a bit easier-to-read format). 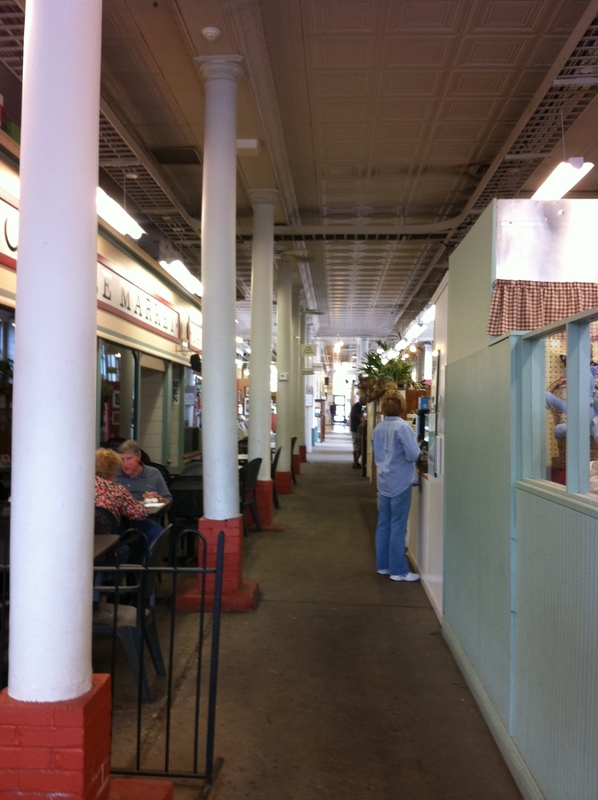 The main corridor in the older section of Centre Market in Wheeling. Today, the entire building remains open to the public as an open market, with a handful of restaurants, shops and an art gallery. In addition, the streets on the east and west of the building (both of which are Market Street, one southbound and one northbound) currently host a number of more shops and restaurants, thereby creating a small shopping district within historic buildings. The buildings are owned by the City of Wheeling. While in some ways the market serves a notably different purpose as an attraction today than it did 100 years ago as a necessary supply destination, its purpose still lives on as an important asset to Wheeling’s commerce. Each of the businesses in the actual Centre Market and the surrounding neighborhood has its own hours, though there are businesses open every day of the week. Parking is available along Market Street and nearby streets. To get to Centre Market from U.S. 40, follow Main Street south to 22nd Street, then turn left. The Market is on the right. From I-470, take Exit 1, turn left at the end of the ramp, left on 26th Street to Main Street and then turn right (north) on Main Street to 22nd Street. The southern building of Centre Market, built in the late 1800s. 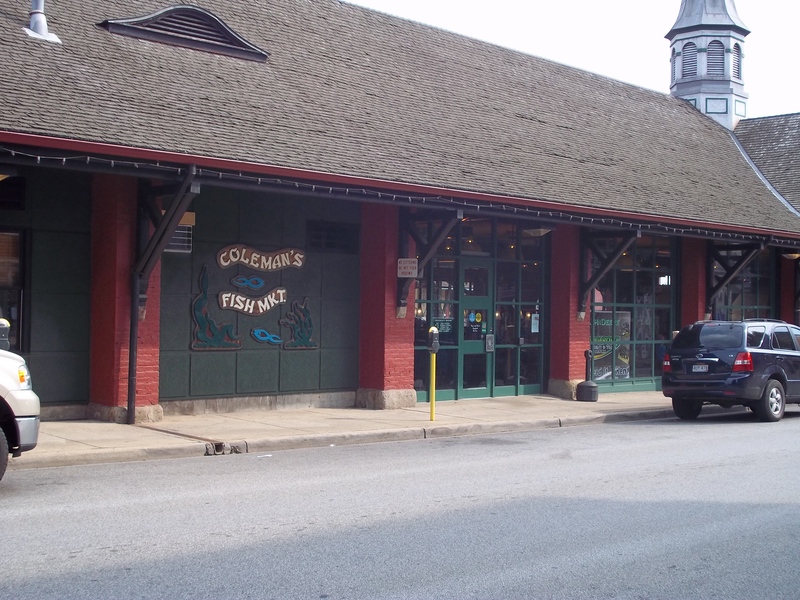 Mile 132 – Coleman’s Fish Market, Wheeling, W.Va.
One of the outside entrances to Coleman’s in Wheeling’s Centre Market. Before I set out for Wheeling, I asked my friends knowledgeable about the Northern Panhandle (one being Wellsburg, W.Va., native and Morgantown food blogger Candace Nelson), “Where should I go for a taste of Wheeling?” The two responses that kept coming up: Coleman’s Fish Market and DiCarlo’s Pizza. Both seem to be honored eateries for the Wheeling area, and both have a long history in the region. I started with Coleman’s, which is tucked into the revitalized Centre Market district of Wheeling, just a few blocks from the National Road. To me, what makes this 98-year-old establishment really unique is that the name describes exactly what the business is: a fish market that also serves great seafood. 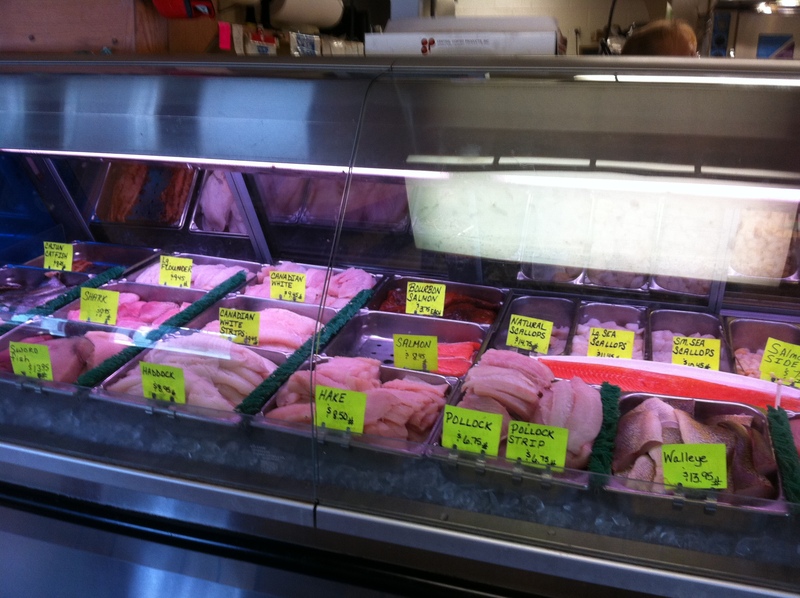 One of the seafood cases at Coleman’s. There are two ends to Coleman’s: the restaurant part, where you wait in line to order and receive prepared food, and the fish market, which sells a huge variety of fresh, raw seafood. The “traditional” menu item is Coleman’s fish sandwich, which is several strips of fish put between two slices of white bread. There’s also a version which has a sauce over the fish, but I stuck with the regular sandwich and Coleman’s thick seasoned fries, both of which lived up to my high expectations (since I only had heard great comments). After the food order is finished, tables are outside Coleman’s door in Centre Market in a larger, open seating area. When I visited on a Friday evening, both the fish market and restaurant weren’t packed, but definitely had a steady stream of customers. Coleman’s is featured on Roadfood, which provides some other great meal ideas and a little history. 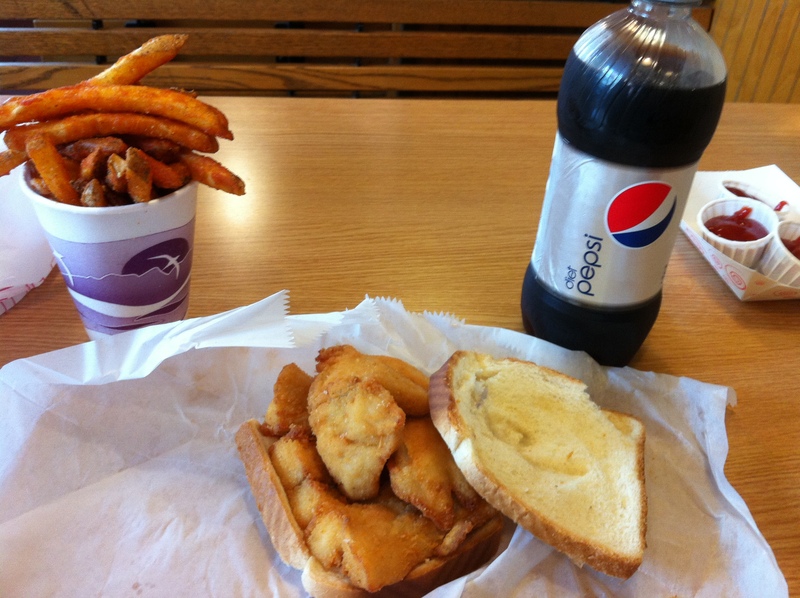 Coleman’s fish sandwich and seasoned fries. Coleman’s had its start in 1914 by John Coleman, and has remained in the family throughout its history. As far as I know, it has remained in Centre Market for its entire existence. Centre Market is an attraction in itself, with the oldest section dating to 1853. Coleman’s is open Monday and Tuesday from 10 a.m. to 5:30 p.m., Wednesday, Thursday ad Saturday from 9 a.m. to 5:30 p.m. and Friday from 8:30 a.m. to 7 p.m. (perhaps to help cater to Wheeling’s Catholic population during Lent?). It is closed Sunday. To get to Coleman’s from U.S. 40, follow Main Street south through downtown and across Wheeling Creek. Make a left on 22nd Street until it intersects with Market Street. Parking is available on streets surrounding Centre Market. To reach Coleman’s, call 304-232-8510. The oft-photographed sign above the indoor entrance to Coleman’s. Mile 127 – Madonna of the Trail (W.Va.), Wheeling, W.Va.
West Virginia’s Madonna of the Trail has it’s own pullout for seeing the statue up close. 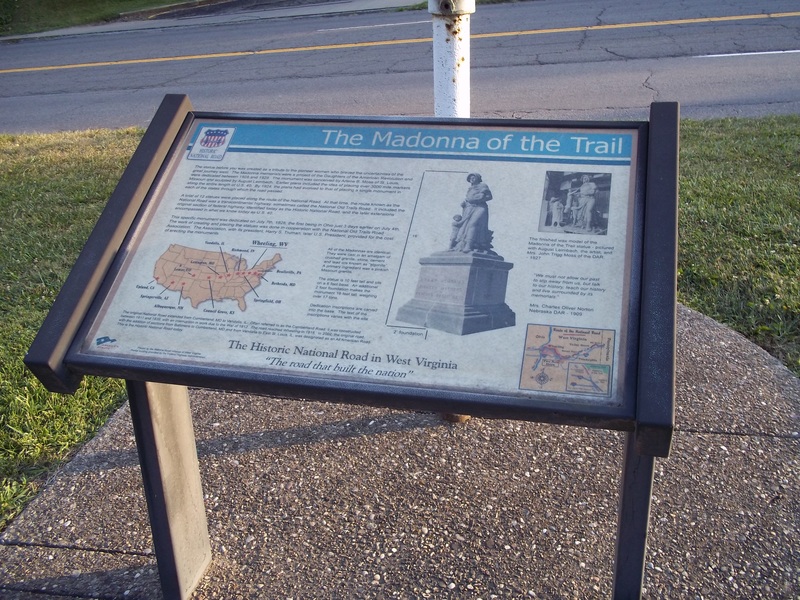 Coming from the east, West Virginia’s Madonna of the Trail is the third such statue one comes upon if following the National Old Trails Road route (along which the monuments were laid), or the second statue if following the National Road (which is part of the National Old Trails Road). 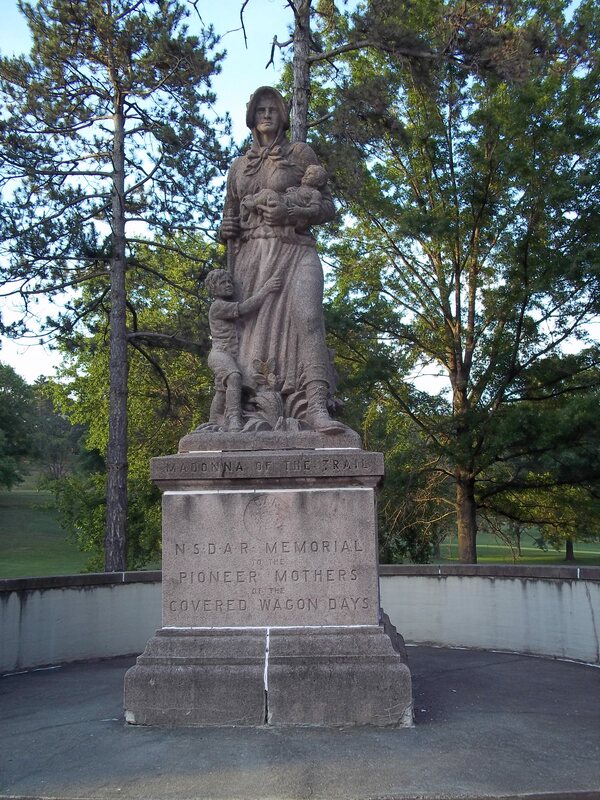 West Virginia’s Madonna statue was the second to be built, after Ohio’s monument in Springfield. The West Virginia statue was dedicated in July 1928 (see this previous post on the Pennsylvania statue for a brief history of the origin of the statues). The West Virginia Madonna is the second oldest of 12 in the country. Unlike the Pennsylvania statue, which isn’t as visitor-friendly (it’s right up against a higher-speed stretch of U.S. 40), West Virginia’s Madonna is set further back from the road and has a turnout dedicated to the statue, which sits in Wheeling Park. 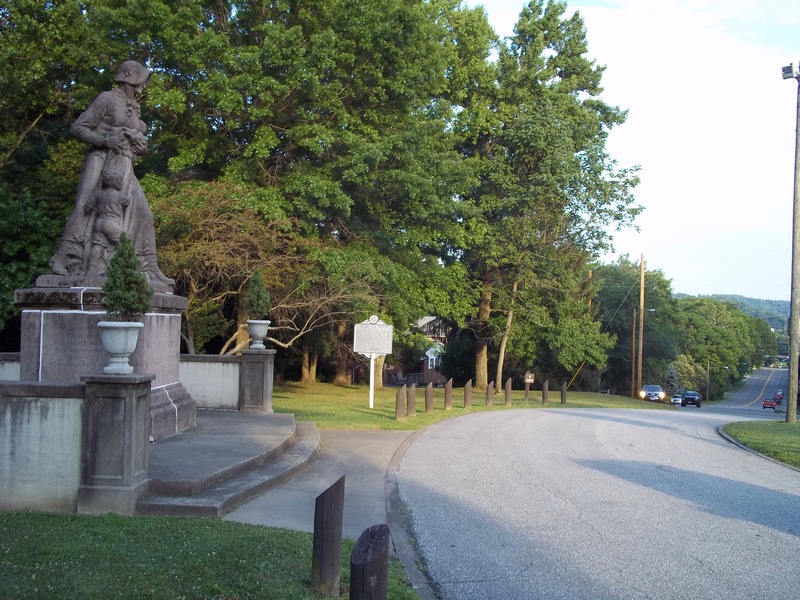 The City of Wheeling assisted the DAR in funding the erection of the statue, and helps maintain the grounds around the statue today. Like all 12 Madonnas, West Virginia’s is identical to the others, and is maintained by a local Daughters of the American Revolution chapter, which is in Wheeling in this case. In my opinion, Wheeling is a fascinating, historic small city, but it is one of the more difficult places to navigate for someone not familiar with the area. The steep hills and Interstates 70 and 470 seem to cut the city into disjointed pieces. So, while the West Virginia Madonna is located in Wheeling, it’s a few miles east of the downtown area. A sign describing all 12 Madonnas at the Wheeling statue.